Killing the pipeline for good would reveal that the incoming GOP majority has little to offer by way of an economic agenda. President Obama will not sign legislation to approve the Keystone XL pipeline, the White House said Tuesday. The veto threat came as Republicans assumed the majority in both chambers of Congress, having promised to make green-lighting the tar sands project their first priority. “There is already a well-established process in place to consider whether or not infrastructure project like this are in the best interest of the country,” White House press secretary Josh Earnest told reporters. Just hours before the White House’s announcement, Republican John Hoeven and Democrat Joe Manchin introduced a bill in the Senate that would circumvent the State Department review. Debate could be lengthly, as Democratic leaders indicated that they would offer a number of amendments intended to make the project more palatable to the left. This may be a self-defeating strategy; As Rebecca Leber notes, the amendments don’t solve the essential problems with the pipeline—namely, the climate implications of expediting the consumption of tar sands oil—they just distract from them. The bill appears to have enough support to overcome a filibuster in the Senate, but not with a veto-proof majority. That means that the decision to approve the pipeline is still Obama’s. The indication that he’ll resist the GOP’s strong-arm tactics is encouraging, since the KXL legislation is the first of many anti-environmental bills likely to land on his desk thanks to the GOP majority and a handful of energy-state Democrats. Expect to see the Environmental Protection Agency’s new limits on emissions from power plans to come under fire soon. 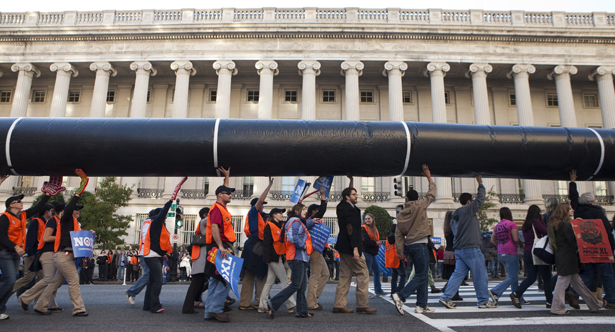 Obama could end the years-long KXL spectacle simply by declining to approve the project. That would be an obvious victory for the climate movement, but it would also be useful for exposing the bankruptcy of the GOP majority’s economic agenda. The pipeline—and the projected thirty-five permanent jobs it would create—is, at this point, the centerpiece of that agenda. So long as Republicans can continue to hold show votes on the project, they’ll continue to blame the White House for obstructionism. But if the pipeline were killed once and for all, particularly at a time when low gas prices make energy projects seem less pressing, it would become even more obvious that the GOP has little else to offer when it comes to economic policy. Obama’s commitment to the review process means we can expect the drama to carry on at least until the Nebraska Supreme Court case is decided. And even if Obama vetoes Congress’ KXL bill on the grounds that it undercuts his authority, it’s possible that he would approve the project itself later on. Activists are continuing to demonstrate against the pipeline this week, aware that the fight is very much still on.